Taking place some time in between Star Wars: Episode III – Revenge of the Sith (2005) and Star Wars: Episode IV – A New Hope (1977), the new movie in Disney’s Star Wars franchise revival is every bit as exhilarating and as thrilling as The Force Awakens. Directed by British director Gareth Edwards (Monsters 2010), Rogue One may not be a fully fledged Star Wars “episode”, but it is however packed-full of all the familiar themes attached to its predecessors. Felicity Jones is remarkable as Jyn Erso, the fugitive daughter of Galen Erso (Mads Mikkelson) a genius scientist captured and recruited by the empire to build a new planet destroying weapon. 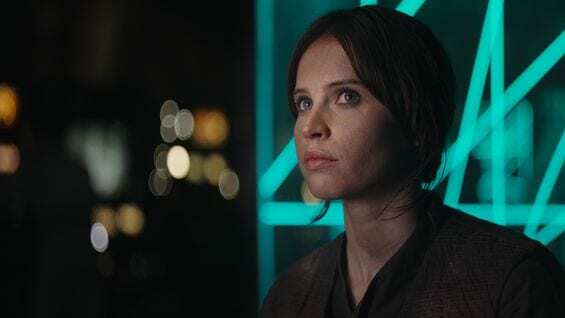 After receiving a message from her father in holographic form, Jyn finds herself having to defend his position to the rebellion who are only interested in stopping him by any means necessary. With help from rebel fighter Cassian Andor played by the excellent Diego Luna and defecting pilot by the name of Bodhi Rook (Riz Ahmed), Jyn decides to steal the plan for the Death Star and send it to anyone willing to fight the evil power of the empire. What makes Rogue One different from The Force Awakens, is that it is so much more than a nostalgia trip. However, bringing back some fan-favourites in CGI form is an inspired idea. Seeing Peter Cushing being digitally resurrected as Moff Tarkin has to be one of the most astounding things you will see at the cinema this year. Another aspect which sets the film aside from its predecessors is that it has the feel of a well crafted war movie in the traditional sense; some of the scenes are reminiscent of World War II battle scenes that could rival some of Steven Spielberg’s best work, this is a testament to Edwards excellent directing prowess. By far the best and most convincing performance must go to the excellent Ben Mendelsohn whose role as Orson Krennic will put Adam Driver’s stroppy turn as evil Kylo Ren to shame. It is also worth mentioning Forest Whittaker in the role of extremist rebel Saw Gerrera, a man with no mercy for those who don’t share his extreme views. On the whole the film does exactly what it sets out to do without piling on the nostalgia, but also by keeping the faithful happy. A very enjoyable 2 hours and 15 minutes which is sure to make its money back and then some. Rogue One is in cinemas from Friday 16th December.